Deba Prasad Das was the first guru to present Odissi outside of Orissa, when in 1958 he accompanied two young dancers, Priyambada Mohanty and Dhirendranath Pattnaik, at a youth festival in Delhi. Not long after, he toured the world with Indrani Rahman, leading her musicians with his pakhawaj and spoken ukkuta, while she danced before Queen Elizabeth II, several other heads of state, and great artists like Martha Graham. Together they created a sensation, and Odissi remains today one of the most popular of Indian dance forms – both in India and abroad. Though ‘Deba-sir’, or ‘Debu’, as he is fondly known, died far too early (in 1986 at the age of 54), his work lives on in his students - teachers and performers alike - and in his compositions. To commemorate the style of Odissi that he in retrospect established, an International Odissi Festival was held recently in New Delhi at the Habitat Centre under the auspices of Bansi Bilas, a Bhubaneshwar-based foundation, ably supported by Sangeet Natak Akademi, as well as HCL and many Oriya businesses. For three days, seminars were held during the mornings, while in the evening we watched several dancers in compositions by Deba Prasad Das or in tribute to him. The brainchild of Leesa Mohanty, (student of Durgacharan Ranbir, who only saw Deba-sir teach her elder sister Leena), the Festival was intended not just as a showcase for Debu’s shaili. It aimed to show the great variety in this dance form by presenting the styles of several Odissi gurus. While the first day was dedicated to Deba Prasad Das, the second featured four other geniuses: the great Guru Pankhaj Charan Das, Guru Kelucharan Mohapatra, Guru Surendranath Jhena, and Guru Mayadhar Raut. The last day was reserved for Debu’s shishya, like the late Guru Srinath Raut, Guru Durga Charan Ranbir, and Guru Gajendra Panda. The mornings’ proceedings were chaired by eminent scholars, and critics - Sunil Kothari, Shanta Sarbjeet Singh, and Ashish Khokar - and held together by the gracious, Leela Venkatraman, who was always there to help Leesa and her unseasoned, but indefatigable, helpers. Presenters included many gurus, and their students (often their daughters! ), as well as leading musicians who support this gurukul - like the singer-composers Shri Rama Hari Das, and Shri Bankhim Sethi, and pakhawaj guru, Dhaneswar Swain, who spoke on raagas and taalas in Odissi). The whole event was launched with a lamp-lighting by Debu’s widow, Guru-ma Jitarani Das, followed by a film tribute to her husband, which Ashish Khokar praised as a very model of how such films should be made. It included interviews with many senior dancers of this gurukul, as well as poets, filmmakers, and like people connected with his life – many of whom could not attend the celebration. And what a celebration it was. That evening we saw how wide-ranging Deba-sir’s repertoire was. From the Mahakali sloka and shabda swara paata (rhythmic chants from temples in the Sambhalpur district) danced by Guru Durga Charan Ranbir, to the many different styles of abhinaya presented by Debu’s stellar students like Sangeeta Dash, Leena Mohanty, and his daughter, Bipanchi Das; each dancer was distinctive. No clones here! In fact, Bipanchi stole the first evening with her performance of Debu’s navarasa sloka. When, dressed in a Mahari-style sari and anchala blouse, she ‘swaggered’ forward to try her hand at Shiva’s bow during Sita’s swayamvara (for veera rasa), the audience burst into applause. By the time she had got to vibhatsava, with its graphic representation of a dog demolishing a carcass, she had us in the palm of her very able hands. It was a proud moment for the gurukul to see her hold her own with the likes of Geeta Mahalik, who performed a beautifully rendered Oriya geet, and Guru Gajendra Panda in dasaavatara. The next day, dedicated to four other great Odissi gurukuls, was a veritable feast. The morning was fascinating. First, Dr Ratna Roy showed very clearly the distinctive elements of Guru Pankhaj Charan Das’ style. 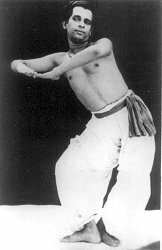 Then Guru Gangadhar Pradhan talked about his early gotipua training as well as Kelucharan Mahapatra’s style. After a tea-break, Pratibha Jhena, accompanied by her father Guru Surendra Nath Jhena (he intones his ukutta so beautifully!) showed us what really makes his style so very modern, innovative, and ahead of its time. She was followed by Guru Mayadhar Raut’s daughter, the articulate Madhumita, who (with her colleague Yamini) focused on his major contributions to Odissi. What a treat it was that evening to see Dr Ratna Roy and her daughter present old Mahari compositions – a thali dance and ‘Kunti’ - by Pankhaj Charan Das, followed immediately by the elegant Madhavi Mudgal. Her rhythmically unusual Pallavi preceded an Odiya geeta, which Debu had himself presented at Madhavi’s Angahar Festival in the mid-eighties. Next came the lithe Pratibha Jhena. The poses she falls into really do seem like temple sculptures we actually see. When she screws up her eyes impishly in her abhinaya she is a gopi communicating with Krishna. Yet when she crosses her eyes and drops her tongue, she is a yogini from the Hirapur temple. Madhumita, with Yamini and her students, presented compositions typical of their gurukul, which included an ashtapadi as well as a group composition of nritta. And to top the evening there was Sonal Mansingh, in excellent form, who first presented an extremely original Pallavi which she had worked on with Guru Srinath Raut. The music was by Bankhim Sethi, who reminded me that he worked for six years with Deba Prasad Das in Bhubaneshwar before he came to Delhi. By the time Sonal ended with a moksha-like finale, the audience was replete. The last evening brought us performances by the wonderful Malaysian dancer, Ramli Ibrahim, accompanied by January Low, one of his many talented students from Sutra –Kuala Lumpur based school and dance company. As they performed a mangala charan in praise of Hari-hara the last night’s audience sat up excitedly in their seats. We were then treated not only to a Kalyana Pallavi by the multi-faceted Shivani Wazir Pasrich (a student of Srinath Raut and now of Durga Charan Ranbir), but also to Leesa herself in a charming Odiya geeta: “Muha muhi Kishore . . .” which gave full scope to her expressive face and eyes. Ramli (who studied for a long time with Debu and now works with Guru Gajendra Panda) returned with an ashtashambhu, which he brought alive with his wonderfully trained male dancer’s body. Jyoti Srivastava, senior student of Srinath Rauth and now with Guru Ranbir, danced a Kalabati saabhinaya Pallavi (a hallmark of Debu’s style, in which the rhythmic dance is followed by abhinaya in the same raga). Dr Minati Misra, senior-most student of Deba-sir and ex-principal of Utkal Sangeet Mahavidyalaya where Debu taught, presented “Nindati chandana....." in his inimitable style of abhinaya for ashtapadi. The surprise (and joy) of the evening was January Low who followed her sinuous movements in the Hari-hara duet, with an Odiya geeta, in which a Mugdha Nayika remembers her encounter with Krishna – a perfect vehicle for a sixteen-year old. The festival ended with an Aditya ARCHANA, choreographed by Durga Charan Ranbir and performed by members of his Bhubaneshwar-based dance school and company, Nrutyayana, many of whom are able soloists in their own right. As the last of three very satisfying and successful evenings came to an end and the standing crowds at the back expressed their enthusiastic response, we thanked the many musicians who had so ably supported the dancers. There were times an expected musician was replaced at the last minute by a colleague - testimony to the fact that in any gurukul dancers and musicians know each other’s dances, even if we each put an individual stamp on them in performance. In closing we all did a collective guru pranaam to the photograph that had graced the stage throughout. This man who preferred his native Orissa to a jet-set life-style, and was reluctant even to come to Delhi to teach, had been shown to be a seminal force in Odissi. His mix of margi and desi elements, of tribal steps with carefully crafted arsa (rhythmic combinations), of tandava with the typical lasya, give his style a classical balance. 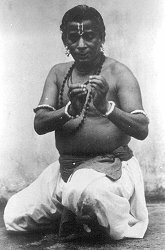 His wide use of Odiya geeta as well as ashtapadi, and of shaiva/shakta themes from local tantrism as well as pan-Indian Vaishnava ones, give his Odissi its typically Odiya flavour. Most of all, the body of his work that remains, and his teaching style reflect an openness of mind and an expanded vision of a dance art for Orissa. Rajika Puri, a student of Srinath Rauth and Durga Charan Ranbir, who worked briefly with Deba Prasad Das, presented on the opening night a saabhinaya Pallavi in raaga Sabari, in tribute to the ‘Adi guru’ of her gurukul.